We know that whilst some businesses have thousands to spend on event marketing, others have far less. That’s why we’ve created The Budget Series. What is The Budget Series? It’s not news that events, trade shows and exhibitions cost a lot. If renting the floor space and paying for travel expenses for you and your team doesn’t eat up all your marketing budget, your exhibition stand surely will. For smaller businesses especially, it’s important to set a budget and stick to it. Know how much you’ve got and work to ensure you don’t start spending money you don’t have, but that can be hard when the purse strings are pulled tight. Over the coming months we will be detailing the different ways you can make your money stretch – regardless of how much you have. This month we’re starting at the lower end of the spectrum with a budget of £75. What Type of Event is a Budget of £75 Suitable For? There are thousands of events and trade shows across the world and some will require a much higher budget than others, but assuming you have a smaller floor space like a shell scheme booth, there’s no reason why you can’t create a successful exhibition stand using a £75 budget. Whilst £75 won’t buy you a pop up display, it can get you plenty of other things which are just as effective. 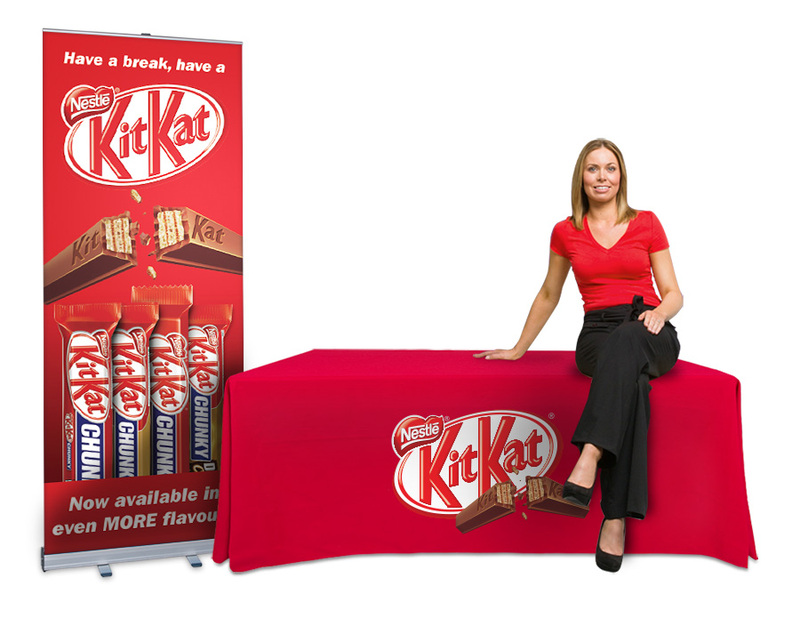 The Grasshopper banner stand is available in multiple widths and prices start at just £49, making it a great choice for businesses on a budget. The graphics are laminated to provide protection against tearing, cracking and water damage, meaning that for a small cost you can acquire a banner stand that will last a lifetime. 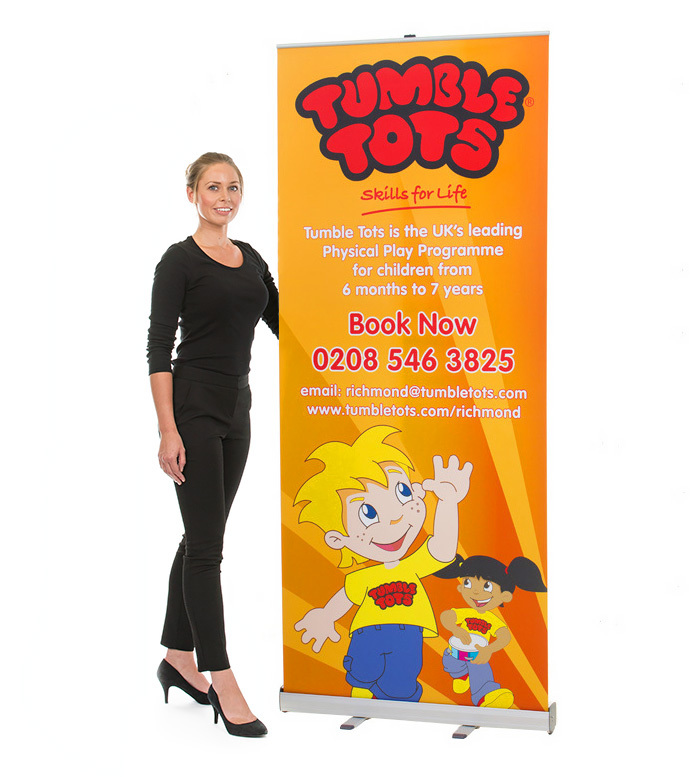 Pull up banners are excellent exhibition solutions because they are so versatile. You can use your banner in a shell scheme booth, in an open floor space, alongside bigger displays or as a lone marketing tool, in reception areas and foyers and even in retail displays. The effortless tool-free assembly and lightweight hardware make the Grasshopper banner stand perfect for businesses on the go which is even more reason to invest in this entry level display. Regardless of budget, printed tablecloths are always a popular choice amongst exhibitors because they offer unlimited flexibility when it comes to applications. Whether you’re displaying clothes in a shop or launching a new product at a trade show, a custom printed tablecloth is a good option to invest in. With prices from as little as £52, you can get your business logo printed onto an exhibition cloth. With a range of styles and bespoke sizes available, tablecloths are an invaluable marketing tool that add subtle branding in a sleek way. The event industry is changing, and its new focus is on creating an experience for visitors by being interactive. An easy way to make your exhibition stand interactive is by investing in an iPad stand. We offer several iPad and tablet displays that fit well within a £75 budget, including the bestselling Universal iPad floor stand which is just £59. If you’re looking to exhibit on a countertop display, we also offer a Universal desktop iPad stand. By showcasing your website, video content, customer testimonials, examples of your work or even hosting a competition on your tablet stand, you’re sure to engage event visitors and create an experiential display they won’t forget – even on a budget. There are countless ways to make the most of your money when it comes to exhibiting. Bigger isn’t always better, and more money doesn’t always mean a better display.